Wherein we talk to Megan Jasper, Sub Pop's CEO about the podcast (meta! ), Sub Pop history, Sub Pop lore, and just a little bit about pranks. As with every episode of the Sub Pop Podcast, season one, episode "ten-point-five" is brought to life by hosts/producers Alissa Atkins and Arwen Nicks from the time out corner that does double duty as the Sub Pop Podcast studio. Let’s get this out of the way: This is not an April Fools’ Day joke. I repeat: This is not an April Fools’ Day joke. I repeat… nevermind. Sub Pop Records recognizes April 1, 1988 as its “day zero,” so April 1, 2016 (“today,” but highly dependent on when you read these words) is our 28th birthday/anniversary. As you should know if you’re reading this, the entire episode is devoted to speaking with Megan Jasper, Sub Pop’s CEO. Let’s meet Megan through some polaroids I photographed on our office walls. We like working together so much, a couple times a year we do forced socializing outside of the office (participation mandatory). You can see from the photo that people don’t like it, but it’s tolerated. Twenty eight is a bigger number than twenty five (obviously), but of course your 25th anniversary is kind of a bigger deal than your 28th. That’s why for the 28th we’re just doing mandatory karaoke (in the office; staff members only) on April 1, 2016 from 2:30 PM to 3:45 PM (kinda cool that it’s a Friday, though!) whereas for the 25th (a/k/a “The Jubilee”) we had a MAJOR blowout, basically taking over the city of Seattle for three and a half months. Or at least taking over the Georgetown neighborhood for an entire day of music, food, beer, and good vibes. Some of the Sub Pop employees mentioned in this episode probably merit introductions. Jonathan (who gets mentioned a lot in the podcast) is Jonathan Poneman, co-founder, owner, and “the person (ultimately) in charge” of Sub Pop Records. Here is Jonathan with another Jonathan, specifically Jonathan Meiburg, the brains behind Shearwater (who, by the way, have a fantastic new-ish record that is more than worth a listen). This is in Georgetown at the Jubilee. Chris Jacobs, as is pointed out in the episode, is Sub Pop’s general manager. In the show his days as a (the?) publicist are mentioned. Which is to say, he used to do other things around here. Here is Chris searching for the nag champa incense that someone hid under his desk as a “joke,” knowing the odor would irritate him (a prank is like a hug, though!). Finally, Megan mentions Jeff Kleinsmith as someone who’s been around for a while. Jeff is Sub Pop’s art director, and has been for over 60 years. Speaking of the Jubilee (as I have been, for some reason – April 1 just brings it out of me! ), we had a pop up shop in Georgetown (Seattle neighborhood) for about a month leading up to our big one day festival. Jeff (and the rest of the art department, to be fair) designed the shop and had a Sub Pop-themed art show in the space. And ex-Sub Popper Dean H (Hi, Dean! ), current Sub Poppers Megan J and Jeff K, plus one of the youth engaging in “photo bombing” at the pop up shop. Jeff has put his mark on so many album covers, posters, shirts, and EVERYthing that Sub Pop produces… the mind boggles. You’ve even seen his posters on the walls of Erlich Bachman’s house in seasons one and two of Silicon Valley (and maybe in subsequent seasons, but I can’t see into the future). Not the greatest image, but the poster that says “11⁄100” is a Jeff Kleinsmith. I don’t think every poster in this hallway is a Jeff Kleinsmith piece (though many of them are), but he probably decided which posters to hang here (if he didn’t, let’s just pretend he did, OK?). That’s enough introductions for one day. Megan mentioned two artists that were catalysts for sort of… righting the ship in the early 2000s. The Murder City Devils are one of those bands. Let’s see. 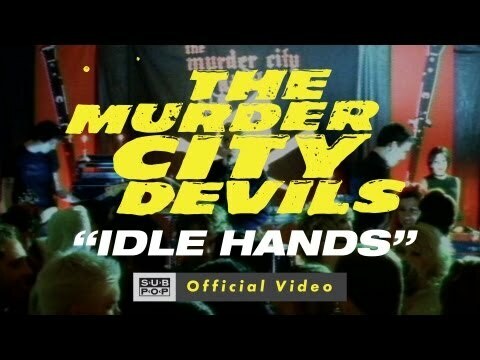 The Murder City Devils “Idle Hands” from In Name and Blood. The other artist is The Shins. If you aren’t familiar with Oh, Inverted World, their first album, you owe it to yourself to check it out. Is it a perfect album? Maybe. 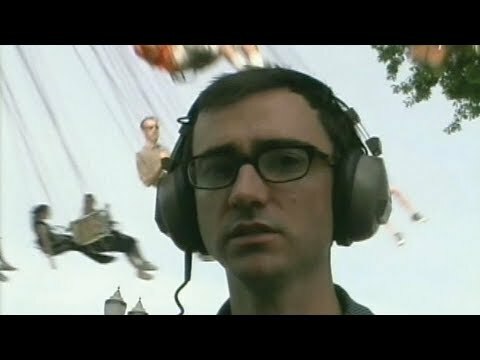 The Shins “New Slang” from Oh, Inverted World. Seinfeld: Elaine on grace, one. 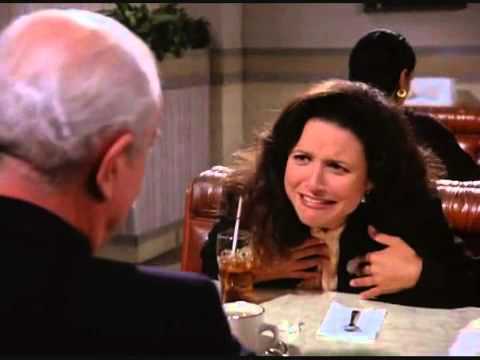 Seinfeld: Elaine on grace, two. OK, that’s about it. We have here a couple more John Atkins pieces that were candidates for this episode’s illustration. A bonus to the bonus, if you will.